manufacturers and distributors improve their operations. 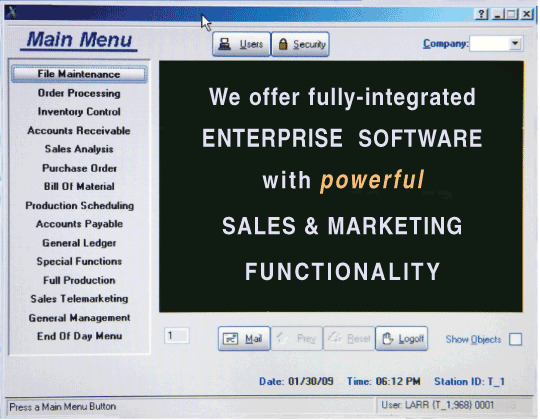 This enterprise software, primarily used by manufacturers and distributors, has all of the features (and more!) that helped Larry become successful in his wheelchair parts business; Larry promotes this software to clients and prospects who can best utilize its robust features. These systems been under continuous use and development for over 25 years and is fully supported. It is primarily used by manufacturers and distributors with 10-1,000 employees, operating 5-100+ user systems - some having multiple locations. Its optional sales and marketing, and contact management features are fully integrated and can help you improve the top and bottom line performance of your organization. Helps sales staff and customer service reps to better understand what each customer/client has purchased in the past AND will more likely purchase in the future! Contact Larry Rudwick for more information and to arrange a demonstration. .
Do you know companies that are looking for this type of software? We are currently recruiting lead finders to help us do so. Would you like to find out more about this program?